As a specialist in cable and connection technology, it is of pivotal importance that we precisely understand the environment in which our products will be used in future. This is the only way we will be able to develop optimum solutions for our customers. This is why we are actively involved in the SmartFactoryKL technology initiative run by the German Research Centre for Artificial Intelligence (DFKI). The objective: development and testing of ground-breaking products and solutions for Industry 4.0. The research project SmartFactoryKL impressively proves that the 'plug & produce' production model is already working today. 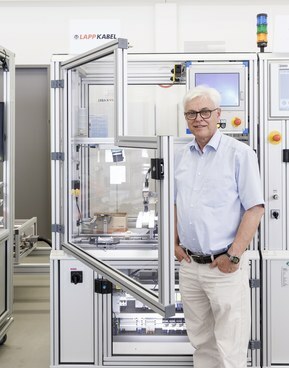 With the SmartFactoryKL, the DFKI – together with around a dozen prominent industrial partners – has realised a complete production line in which the individual modules from different manufacturers work together perfectly with various control architectures. With the help of a digital product memory, the fully-automated production plant effects workflows with decentralised control and produces various product variants in accordance with individual customer requirements. The individual production modules automatically detect the plant topology so that this can be extended or modified without lengthy interruptions in production and is ready to use again within minutes. This makes production highly flexible. Cost-effective production in single-item batches is brought within tangible reach. The Lapp module is responsible for final inspection and commissioning in the SmartFactoryKL. Using the example of the production of a card holder, the plant shows that the consistent use of Industrial Ethernet as a communication medium and hence networking from ERP level right up to the individual sensor and actuator is already possible today. Quality control is effected via an Ethernet-capable high-resolution camera and an intelligent electric claw with a PROFINET® connection sorts the parts and issues the finished products to the visitor. This is based upon Ethernet cables that are suitable for use with power chains, which can both transmit large amounts of data and also withstand the particular stresses of an industrial environment. Lapp played an important role in the joint development of the connection technology. Industrial data cables and connectors from Lapp make an important contribution to reliable operation of the plant. The result is a real experience! 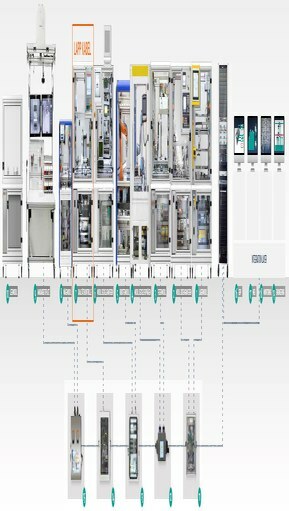 Intelligent, modular – and ready for use in industry: the Industry 4.0 system from SmartFactoryKL.